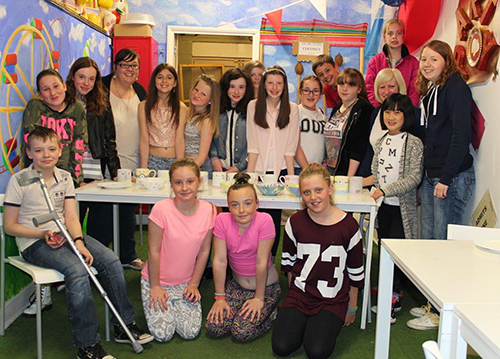 "Aspire not to want more …but to be more"
Pictured above are members of the youth club on a visit to Hipo-pot-a-mess in Redcar, where they had a chance to paint a mug, plate or bowl. During the visit they all enjoyed pizza. Photo by Kerri Dowling. 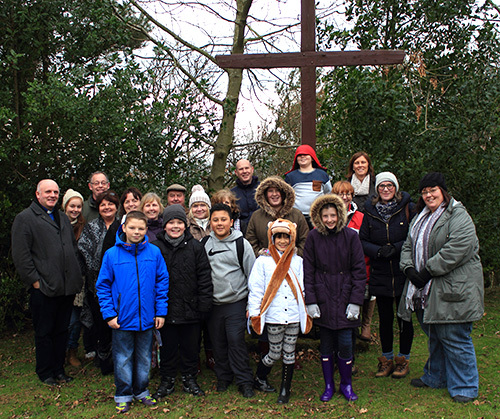 Families from St. Andrew's Parish Youth Club visited the Lady Chapel at Mount Grace on Sunday, December 8th, the Feast of the Immaculate Conception, for a short afternoon retreat to celebrate the start of Advent. After walking the Stationsof the Cross and posing for our photo above at the 14th Station with St. Andrew's Parish Priest Fr. Edmond Gubbins, they enjoyed a packed lunch before a short service in the chapel. Photo by Kerri Dowling. 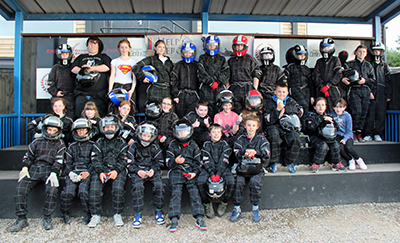 Pictured above are members of St. Andrew's Youth Club on a recent visit to the South Bank motor sports track of an evening of go-karting. Seventeen parishioners from St. Andrew's Parish returned from pilgrimage at World Youth Day 2011 in Madrid on Monday, August 22nd at 11.00 pm feeling a little weary, but refreshed and renewed in their faith. It was a week of personal highs and lows; of disappointments and frustrations; of laughter and tears and of deep spiritual encounters which came in the most unexpected ways. 2. To let them see that they were not alone in their faith. When we first put the idea of going to Madrid to our young people, the first thing I told them was that World Youth Day was “not a holiday”, it’s a pilgrimage. Nothing could have prepared us beforehand for all the emotions and experiences we encountered in Madrid. It was a very challenging week and we all had low points, but they were far out weighed by the many high points and spiritual encounters that we all experienced through the week. From the start members of the group set out to collect signatures and messages from young pilgrims from all over the world, including Albania, Portugal, Malta, Spain, America, France, Latvia and many, many more. On Wednesday we tried unsuccessfully to get into one of the English speaking Catechesis sessions and so, disappointed, we headed to Retiro Park for the Festival of Forgiveness and Exposition of the Blessed Sacrament. This turned out to be an excellent day and a highlight for a lot of the group. On Thursday we tried and failed to get into another of the English speaking Catechesis sessions because of the huge numbers so we set about looking for another session. But on the way we happened across another church and we went in. Another small group from Italy was celebrating Mass with the priest accompanying them and so we stayed and joined in with them. After the Mass we went to talk to them. It was a friendly and moving moment, two groups usually separated by the miles being brought together by their faith. On Thursday evening we were in a crowd of a million plus to hear the Pope address the young people from across the world. We were sat on the Kerb in front of a huge screen and it was an awesome and moving atmosphere as we waited for the Pope to arrive. Friday we finally managed to get into an English speaking Catechesis session at the Church of San Ricardo. It was led by the Bishop of Brooklyn. It didn’t take us long to realise that this is where we were meant to be. The Bishop was well tuned in and connected to the young people as he spoke on the theme of ‘Going forth firm in the faith’ and he encouraged them to go back to their various parishes and not be afraid to stand up for their faith, live their faith and spread the word. On Saturday evening we set out with great spirits for what was hoped to be the high point of the week. We were about to take part in an overnight vigil with the Pope and more than two million fellow Catholics. We traveled out of the city centre by metro and walked for over an hour to an aerodrome in a barren piece of wasteland. We thanked God for sending a light cloud to cover the blazing sun and a pleasant breeze to help make the journey more comfortable, little did we know what was to follow! We arrived at the gate to our allotted space to be told that the authorities had let unregistered people in and that there was no room for us inside the aerodrome. We took this on the chin and decided to find somewhere on the wrong side of the fence to settle down for the night. We could watch the proceedings on the big screens that had been erected outside. A group of us went in search of the food parcels that we had paid for to keep us fed and watered over the next 18 hours, only to be told that we couldn’t be guaranteed these as they were on the other side of the fence too! That’s when we were approached by two ladies from Poole in Dorset who were glad to here an English voice. They had arranged to meet up with their diocese but in a field of 2 million people they had little chance of finding them and they were worried about being on their own in such a huge crowd so we invited them to join us, and one of them immediately started to cry. And so we adopted two strangers and everyone welcomed them to the group. Shortly afterwards a terrific thunderstorm struck. We decided to take shelter in a nearby tent reserved for exposition of the Blessed Sacrament, along with hundreds of other pilgrims. People were glad to escape from the storm and had forgotten what the tent was reserved for. Priests and volunteers appealed for calm and quiet, some of them raising their voices and banging their fists on the makeshift Altar to get attention but without any success. And then a small elderly nun stood up and started to pray the Rosary and immediately the mood changed as people settled down and started to pray with her as the storm raged outside. It was a deep spiritual moment and afterwards I started to think about our situation; we had no chance of reaching our allocated spot as the authorities had closed off the access; we had a group of hungry teenagers and the prospect of getting our promised food looked very slim at the time and we were in the middle of a thunderstorm. So after a discussion with Fr. Gubbins and other leaders we took the decision to leave the Vigil at 11.00 pm and get the group back to safety. Our adopted ladies had checked out of their accommodation as they were leaving straight after the closing Mass which meant they had nowhere to go and nothing to eat so we took them with us! We arrived back at the hotel at about 2.30 in the morning all fed and watered. We were amazed to see 80 German young people sleeping outside the church opposite our hotel. Fr. Gubbins and I wandered over to them and spoke to a couple of their leaders who were still awake. They also had come away from the Vigil for safety reasons and had checked out of their accommodation and also had had no food. They had made for the church because they said “at least they knew they would be safe their.” After a conversation lasting about an hour we went back to the hotel and were surprised to find some of our young people still up chatting about the evenings events and we told them the story of the 80 people sleeping out at the church. The next morning we found out that our young people had also gone over to them for a chat. They had then come back to the hotel and relayed their story to the duty manager who arranged for coffee and a tray of unused pastries to be taken over to them. What we hoped would be an amazing night turned out to be memorable for many different reasons. We had been turned away, and left without food in a raging storm. Yet we found an acceptance, peace and new friendship in such a strange situation. We were up most of the night and our young people helped two ladies from Poole and a large group from Germany. We didn’t get to celebrate Mass with the Pope but we did gain something quite unique to our little group, a memory that will stay with us forever. SERVING — WITH A SMILE! Twelve young people from St. Andrew's Parish Youth Group gave up their Saturday evening X-Factor viewing to help at a charity dinner recently. 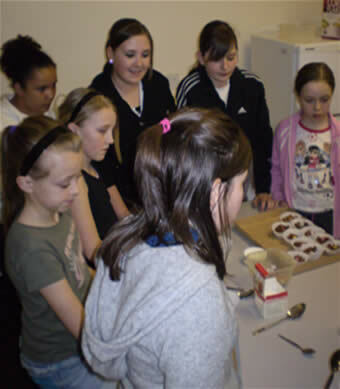 The Youth Club were approached by the charity, Justice First, to ask if any older members would be interested in being waiters and waiteresses for their annual fund raising dinner. And the twelve young people pictured above, all aged between 19 and 15 and including youth club leaders Clare Trainor and Stephen Terry, jumped at the chance without any hesitation. The dinner was held at the Trinity Centre, North Ormesby on Saturday, November 13. The young people arrived at 5.45 pm. Their duties started by greeting guests with canapes as they arrived from 7pm. The 120 guests took their places for the meal at 7.30 pm and the young people then served three courses, cheese and biscuits and coffee with chocolates. The twelve young people finished their duties just after 11.00 pm and went home very tired but with a sense of achievement and pride. Justice First Volunteer, Irene Roderick, who was acting as head table waitress for the event, wrote to the youth club leader afterwards saying: "I recently had the pleasure of working with a group from your youth club at the Justice First dinner. They were polite, helpful and prepared to do whatever needed to be done. 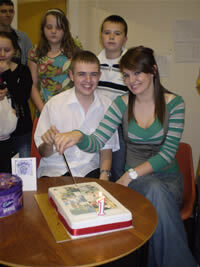 Young people get such a bad press most of the time but your youth group were perfect. Would you please thank them for making my job so much easier than it could have been." And Diocese of Middlesbrough Adult Formation Adviser, Jane Cook who was a guest at the dinner, wrote to Bishop Terence Drainey and St. Andrew's Parish Priest, Canon Edmond Gubbins and said: "Last Saturday evening I had the pleasure of attending the annual 'Justice First' dinner, which seeks to raise money to provide legal and other help to asylum seekers in the most desperate need. 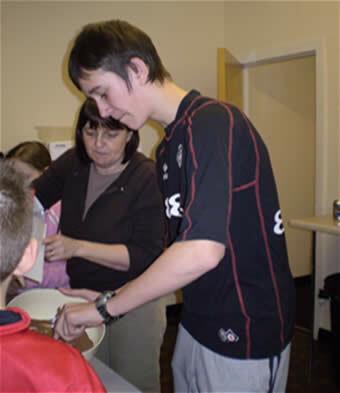 The St Andrews Youth Group worked tirelessly as hosts and waiters for the event – all done with graciousness, enthusiasm, and warmth. Our visitors from London remarked about how fantastic they were. I just felt how overwhelmingly proud we should feel of St Andrew’s Youth and their adult leaders." 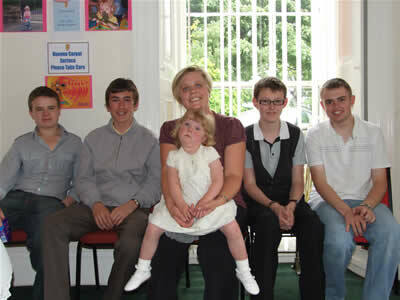 Parish Youth Leader Paul Terry said: "These twelve young people did a terrific job. They worked extremely hard from start to finish and are great ambassadors for St. Andrew's Parish and the Youth Club. I am immensly proud to be associated with each and every one of them." Our photo above shows the 'terrific twelve young people' still smiling at the end of the charity dinner. Photo by Paul Terry. 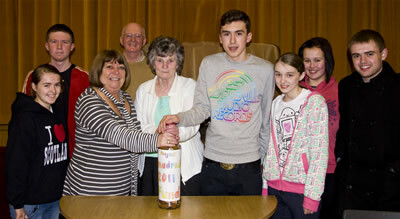 A giant bottle full of loose change has been presented to the Madrid 2011 Fund by the parish bingo section. The bottle contained £122.43. On Monday, February 8, some of the young people who will benefit from the fund went along to the bingo evening for the handing over of the bottle. The Madrid 2011 Fund was set up to help reduce costs of the parish youth pilgrimage to World Youth Day in Madrid in August 2011. Over 2 million young people from all over the world are expected to be in Madrid for the week long giant festival. 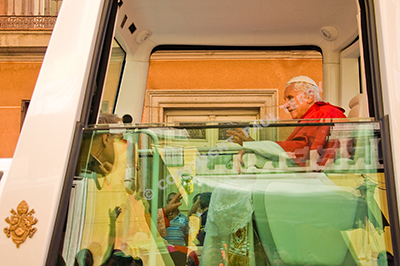 The highlight of the pilgrimage will be a Mass celebrated by the Pope. Currently 14 young people from the parish have their names down to go and some of them are pictured above receiving the bottle from bingo committee members Mary Owen, Ivy Healey and Joe Gallagher. On Tuesday, December 22, members of the Parish Youth Band visited a care home in Eston to perform a short carol concert for residents. The band visited Astune Rise Nursing Home, Eston High Street to play and sing some traditional carols including Come all ye Faithful, Silent Night and Away in a manger. In between each carol one of the young people read a short extract from the Christmas Story. Before leaving the band, pictured below, visited the room of a 95 year old sick resident who was too ill to join the concert. They gave her a personal performance of Silent Night. 18 young people took part in the Voices of Christmas at St. Andrew's Church on Monday, December 11. This was the Christmas story told from the angle of those people who witnessed the events of that very first Christmas. 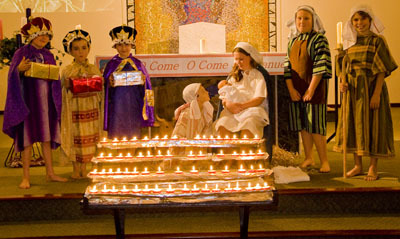 Young people took the parts of a shepherd, a wiseman, the Innkeeper, Herod, Joseph and Mary while some pupils from St. Margaret Clitherow's Catholic School dressed up as the characters and placed a symbol in the crib after each reading. They then formed a nativity scene while the congregation lit candles at the front. It was a very spiritual occasion for all concerned. Congratulations to our young people for all their efforts. Our picture below showing Joseph looking in wonder at Mary and Baby Jesus while watched by Kings and Shepherds. 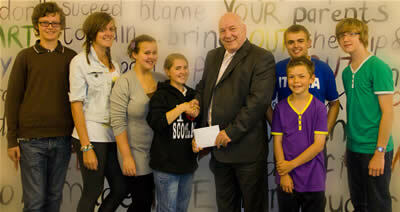 Representatives of St. Andrew's Youth Cabinet and the Youth Club have presented £300 to the Lourdes Sick Fund. The money was raised from sponsorships on the Youth Cabinet's annual Charity Summer Beachwalk from Marske to Saltburn on Thursday, July 2. The presentation was made in the youth club room on Thursday, July 13 to the fund's treasurer, Keith Tillotson by a member of the Parish Youth Cabinet. The young people have asked that the money go towards sending a sick young person to Lourdes. Keith told the young people that it was a marvellous gesture they had made and he added that it was wonderful to see young people doing good for the benefit of others and told them to keep up the good work. The Beachwalk proved a huge success as over 50 people made the trek from Marske to Saltburn on a bright, windy and cold evening. The walk started at 6.15 pm from the stray car park and finished at the pier in Saltburn at 7.45 pm. The time in between was spent either splashing around in the water, kicking a football along the sands or just quietly walking to the pier. A dozen adults took up the Youth Leaders offer to join the young people on the walk and they all enjoyed themselves. After reaching the pier the group made their way up to the town where a bag of chips and tin of coke was bought for everyone. Our picture above shows Youth Club members presenting the money to Keith Tillotson, treasurer of the Lourdes Sick Fund and below some of our young people splashing about for the camera on the beach walk while the bottom picture shows the whole group at the top of the cliff railway. (Photos by Paul Terry). WE'VE GOT THE WHOLE WORLD IN OUR HANDS! We've got the whole in our hands, so the words of the famous song says. And it was certainly true for the young people of St. Andrew's Parish who travelled to Ampleforth on Sunday, July 12 to take part in the diocsean youth event, Springboard. Cafod provided the giant globe costume and one member of the youth club didn't hold back asking if she could try it on and the Cafod representative agreed. Pictured above are some of the young people with leaders surrounding the 'human' globe. 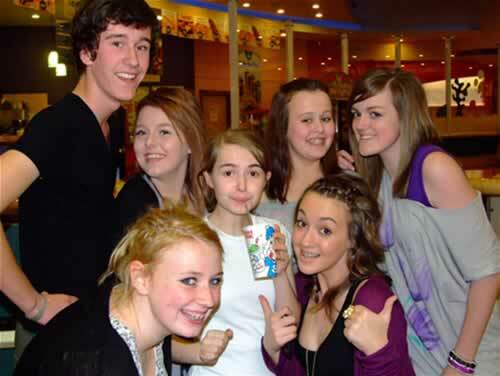 Youth club members visited Hollywood Bowl on Teesside Park for a night of bowling. 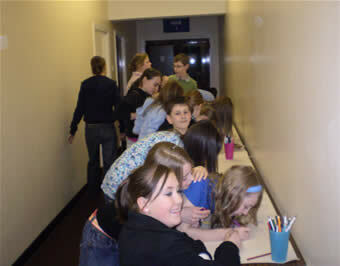 28 young people attended the event on Thursday, April 2 and had a great time. MORE PICTURES. 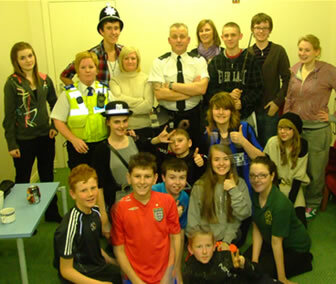 Two community police officers visited our youth club on Thursday, January 29 to give a talk to members. PC Jon Hutchinson and PCSO Wendy Sewell spoke about their jobs as police officers and gave some tips for our young people to avoid trouble and to keep them safe; they also told of some of the dangers they have faced. The policeman, who joined the force almost three years ago, told how after serving in the British army and Australian army he had decided to join the police force after his mother had been assaulted in her home during one night. He said that part of the problem is that young people have no respect for authority in today's society and that people who hang about in gang's and cause trouble wouldn't dream of coming to a youth club because it's not cool for them. He went on to tell of the time he had been threatened by a man with knife in Redcar and how he had that very morning being involved in closing down a 'crack house' in Grangetown. PC Hutchinson also gave a demonstration of how a person could be subdued and handcuffed while being arrested. 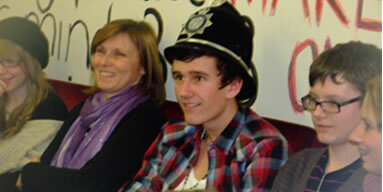 PCSO Wendy Sewell told the group how she was there to offer help to the community and support PC Hutchinson. Wendy told the group that young thugs think that an ASBO is a Badge of Honour but in reality it stops them from mixing with their friends, going into certain areas and gives them a night time curfew. Wendy also told the group that where a police officer carries handcuffs, a batten and cs spray a PCSO doesn't and has to use their mouth's to talk people round but can always call for back up if needed. She continued to tell of assisting PC Hutchinson make an arrest by sitting on the culprit while he was being handcuffed. 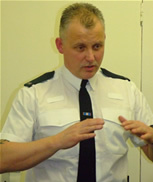 The talk concluded with a questions and answers session and PC Hutchinson had a sing on the karioke. 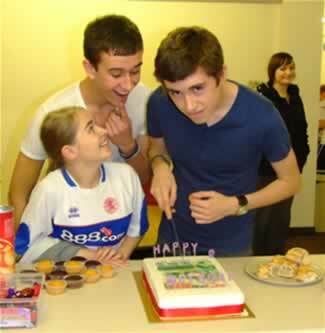 Members of the youth club celebrated the second anniversary of its launch with a party and birthday cake on Thursday, November 27. 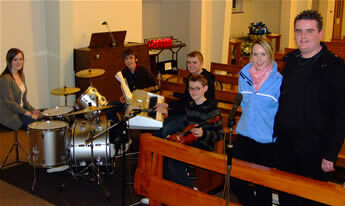 YOUTH BAND 'SHOUT TO THE LORD' FOR ZOE'S PLACE! St. Andrew’s Parish Youth Band rocked the foundations of St. Andrew’s Church when they performed their concert of Christian Worship Music entitled ‘Shout to the Lord’ on Wednesday, October 29. 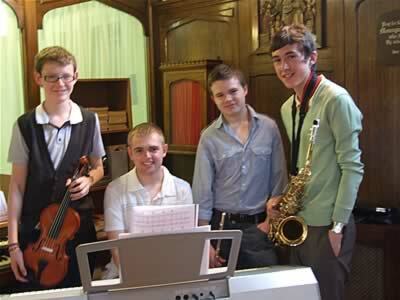 People from various parishes in the Middlesbrough area descended on Teesville for the bands new venture. 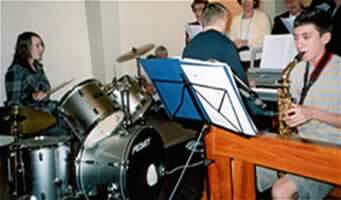 The six members of the band belted out 12 hymns and Christian worship songs in an hour and a quarter and raised a magnificent £340 for Zoe’s Place Baby Hospice in the process. All who are thirsty; Bread of Life; Shout to the North; Our God Reigns. During the interval Danny Regan, representing the Parish Youth Cabinet, gave a short talk on the work of Zoe’s Place and told how on a visit to the baby hospice during the summer to play for a Christening in the chapel, they found not sadness but a really happy atmosphere, full of laughter, singing and clapping. Danny added that this concert is a direct result of that visit. The band opened the second half with Hungry; Christ be our light; How great is our God; On Eagles wings; Shine Jesus shine and they topped it all off with their favourite Sing it in the Valleys which had everyone up dancing and clapping. St. Andrew's Youth Band were asked to provide the music for the christening of a 4 year old girl at Zoey's Place Baby Hospice, Normanby, on Sunday, June 29. The ceremony took place in the chapel at zoey's place and was attended by family, friends, nursing staff and other children who are being treated at the baby hospice. Ruth Lawford of Zoey's Place had heard the band play in St. Andrew's and thought they were the ideal choice to provide the music for the ceremony so contacted Fr. Gubbins who put her in touch with the band. 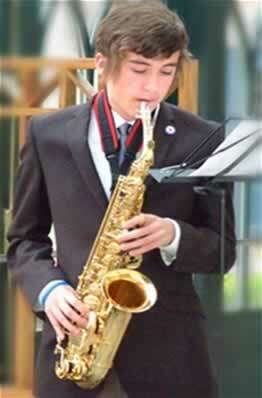 Band members said it was an honour to be asked to play at such an important ceremony for Zoey's Place. After the ceremony a reception was held were family members personally thanked the muscians for giving up their time, pictured below. 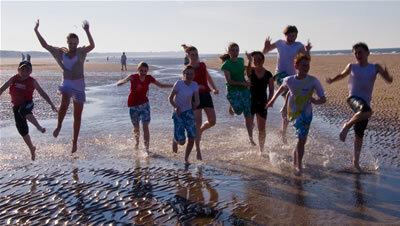 St. Andrew's Parish has formed a new youth management committee which has been called the Youth Cabinet. 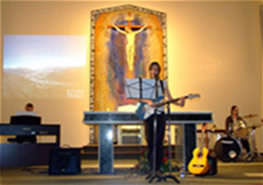 The Cabinet is made up of a mixture of young people and adults the aim of which is to organise both spiritual and social youth events and encourage young people to take part in the life of the parish. There are deliberately more young people than adults so that they have more of a say when reaching decisions. Catherine Kelly; Danny Regan; Stephen Terry; Clare Trainor; Michael Kelly; Hannah Terry; Matthew Trainor; Chloe Littlewood; Nicole Littlewood; Fr. 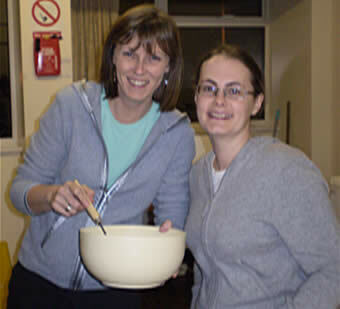 Gubbins; Mrs. Kath Kelly; Mrs. Maria Trainor; Mrs. Christine Regan and Sr. Maria Varley and Paul Terry as Parish Youth Leader; there are also two further places reserved for parishioners from St. Anne’s – one young person and one adult. Our picture above shows St. Andrew's Youth Band with two members of the Legion of Mary who provided the singing. St. Andrew's Youth Band teamed up with young members of the Legion of Mary from Ireland on Friday, March 28 to provide the music to celebrate the evening Mass at St. Andrew's Church, Teesville, and between them produced an uplifting celebration filled with the joy of the resurrection. Members of the Legion from Ireland have been in the parish all week visiting homes. Almost 4000 homes were visited during the week and while visiting they had invited people to their planned Friday evening celebration. St. Andrew's youth band provided the music while two members of the Legion Youth members provided the singing. The two singers from Ireland almost moved members of the congregation to tears when they sang and played Golden Rose — Lady of Knock as a duet for reflection after Communion. The celebration was a real joint effort with the Youth Band and Legion members choosing the hymns which they intended to be uplifting and joyful. They were Our God Reigns; Hale, Hale Hale (gospel acclamation); Blest Are You Lord; Walk in the Light and the celebration ended with a rousing version of Shine Jesus Shine. Afterwards refreshments were provided in the hall. 17 young people between the ages of 12 and 17 led St. Andrew's Parish in the Stations of the Cross on Friday, March 14 at 7.15 pm. This was the first time that young people of the parish had been invited to lead the Stations and it was the result of the excellent work they had put into the Youth Masses throughout last year and the Voices of Christmas in December. The Youth Team had invited the new Bishop of Middlesbrough, Bishop Terence Patrick Drainey, to St. Andrew's for the important occassion and were over the moon that he had accepted their invitation as was Parish Priest Canon Edmond Gubbins. The evening started with the Bishop celebrating the parish Mass at 6.30 pm. The Stations prayed by the young people were those first instigated by Pope John Paul II on Good Friday 1991 and based on incidents from the Gospels leading to the crucifixion. The Stations were started with an introduction by Catherine Kelly followed by a reflection entitled the Cross Room read by Danny Regan. 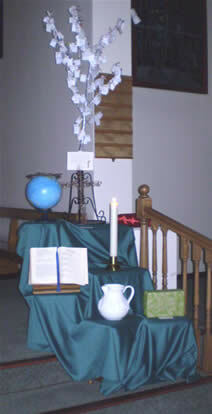 Images of each of the 15 stations were projected on to the Sanctuary wall while the corresponding scripture was read followed by a modern interperatation and a prayer. 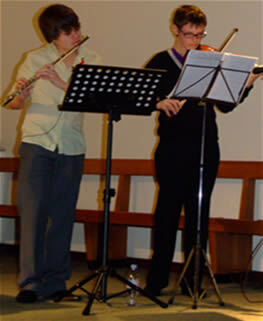 After every third station Daniel Doherty played a verse of 'Were you there when they crucified my Lord' on the flute. The prayers of the Popes intentions were led by the Bishop accompanied by the youth team. After this the Bishop thanked the Youth for creating and maintaining a prayerful atmosphere throughout and for showing people a new way to pray the Stations and told them that they were a shining example of 'joyful hope'. The evening was completed by the youth band playing Shine Jesus Shine. A BIRTHDAY SURPRISE FOR TREASURER! Treasurer Maria Trainor, had an extra surprise on her birthday, which is on St. Valentine's day, a birthday cake together with candles. Everyone thought it was a good idea to look after and pamper the person who looks after the funds! 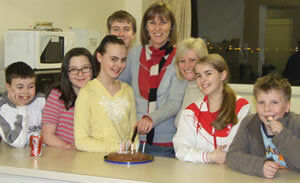 The chocolate cake was made by club member Hannah Coverdale. Pictured is Maria with club members getting ready to cut the cake. 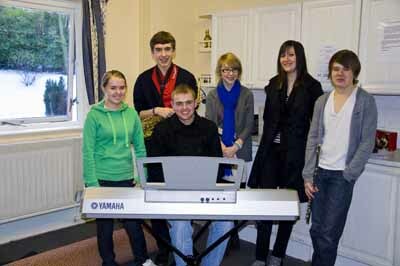 The Senior Youth Team raised a magnificent £228.77 at their Christmas preparation evening, The Voices of Christmas. The evening was a big success with people coming to St. Andrew's from different parishes in the diocese to show their support. The young people portrayed different characters of the nativity which were the Shepherd — The Voice of Declaration; The Innkeeper — The Voice of Greed; the Wise Man — The Voice of Adoration; Herod — the Voice of Deception; Joseph — the Voice of Reason & Mary — the Voice of Wonder. In between each voice the youth band played a carrol. Afterwards mulled wine and mince pies were enjoyed in the church hall. The Diocesan Youth Officer, Fr. John Paul Leonard has paid tribute to all of the young people who took part in the Youth Mass to celebrate Christ The King on Saturday, November 24. He was also amazed at how many young people and families had come to the Mass. More than 30 people took an active part in the Mass and well over 300 people attended the celebration. "Because God will be kind to you!" he said, and the congregation gave him a well deserved clap. After the bidding prayers during the silent prayer our intentions tree was presented and placed on the sanctury. a globe to remind us that Jesus is our King. This was further symbolised by placing the crown of thorns on top of the globe. It was a fitting way to acknowledge the fact that Christ is our Universal King. DID YOU GUESS THE ANSWER TO OUR HOME PAGE QUESTION? 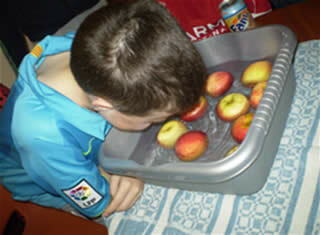 Thursday, November 8, 2007 was duckin apple night at the youth club. It's really amazing what some people will do for a free apple! More amazing pictures by Clare Trainor! A great night was had by all with most people dressing up and entering into the spirit! 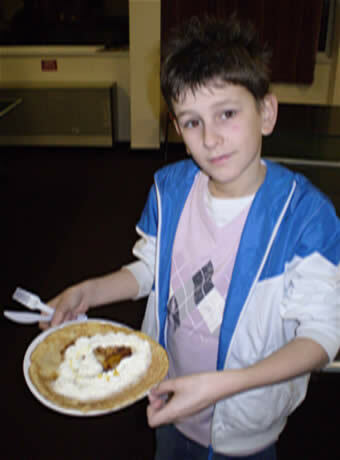 q: WAS THIS PICTURE REALLY TAKEN AT A HEALTHY EATING NIGHT? All eyes were on the tuck shop on Thursday, May 17, where the leaders were preparing fruit kebabs. Very healthy ... that is until they were covered in real dairy milk chocolate. Now that's more like it!!! Thank you to all those young people who took part in our Easter Sunday celebration. 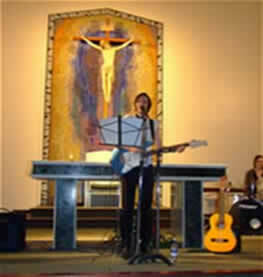 28 young people took part and over 300 people attended the Mass. Once again we have had very positive feedback. Well done to all concerned. SO COME ALONG AND ENJOY YOURSELVES! !